Is bringing multitouch trackpads to netbooks a worthy gesture? The dot m/a's fancy trackpad takes center stage, but should it? Packard Bell is no newcomer to the netbook game, having released models more than two years ago. 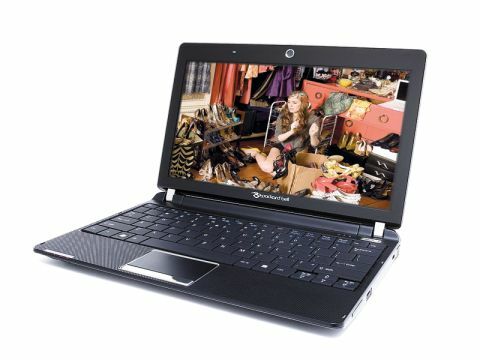 Its latest device is the 11.6-inch dot m/a which features an AMD processor and also boasts a 3G module. AMD processors are quite rare in the netbook market but performance is good and we found that running office applications, and even basic media programs, wasn't an issue. This is especially impressive considering the netbook is running the infamously resource intensive Windows Vista Basic. The 160GB of hard drive storage provided is fairly standard these days, and will provide more than enough space for you to store your work files and folders. The 11.6-inch screen-size is becoming increasingly popular, but is still relatively rare. It is bright enough, and exceptionally detailed thanks to the 1366 x 768 pixel resolution, making viewing photos and videos a pleasure. The glossy Super-TFT screen coating enhances contrast, but proves distracting in bright light, however. The keyboard is large and provides a good typing action, but employs a new layout whereby keys are independently built into the board. This leaves a space underneath the keys where dust and dirt can easily build up – which could eventually hinder the action. The touchpad is large and boasts multitouch functionality. While great in theory, in reality it is twitchy and features no sensitivity settings that we could find – a frustrating experience is the result. The machine's portability is good. The plastics the chassis is built from are durable, and at 1.3kg this netbook won't be a pain to carry around – the 235 minutes battery life is also strong and provides good usability on the road. Connectivity is good, with 802.11g Wi-Fi and a 3G module enabling high-speed web browsing whenever in range of a mobile phone mast. Finally, three USB ports and a VGA out round off the specification. The Packard Bell dot m/a is a very nice machine. Performance is great, and user functionality is also good – with the 11.6- inch screen particularly impressing. This is a very impressive consumer netbook.